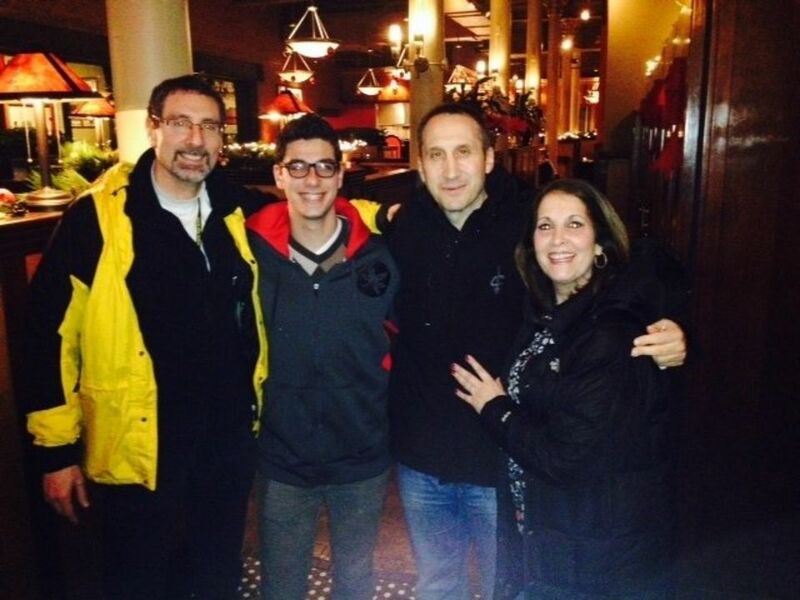 From left, Mark Sack, Ben Sack, David Blatt and Aviv Sack pose earlier this year in downtown Cleveland (Mark Sack). BEACHWOOD, Ohio – On Sunday, Cavs Coach David Blatt was scheduled to help chair a dinner for Israel Bonds, a brokerage firm that sells treasury bonds for the Israeli government. The dinner will honor KeyCorp CEO Beth Mooney and PNC Bank Regional President Paul Clark, both of whom have supported Israel Bonds. The event will also recognize Mark Sack and his wife Aviv, longtime friends of Blatt who are active in several local groups, including the Jewish Federation of Cleveland. But Blatt will miss the dinner. His Cavs are playing in game five of the NBA finals in Oakland that day. "We had been hoping for a four-game sweep of the Warriors, so that he would be available Sunday, but now our hope is that the Cavs close out the series that night," said Sack, an Orange resident and Cleveland Heights High School teacher who played basketball with Blatt in Israel 30 years ago. Blatt, who was named Cavs coach last June, is the former coach of the Israeli championship basketball team Maccabi Electra Tel Aviv, which visited Beachwood High School for a practice session in October. Outside the Q, Blatt has made few public appearances in his short time here. In December, he participated in a menorah lighting in Public Square,organized by Downtown Chabad Center of Cleveland. But the local Jewish community is impressed with Blatt's sincerity. In February, Blatt spoke at Shaw Jewish Community Center's annual sports dinner in Akron. The Massachusetts native talked about his years playing basketball in the United States and Israel. "He was very personable and down-to-earth," said Eric Goldstein, executive director of Shaw JCC. "He came early and met with our VIP group." Said Sack, "No one outclasses David Blatt." Sack, who grew up in Cleveland Heights, played basketball at Brandeis University, while Blatt played at Princeton. They met in 1980 after they were both recruited to play professionally for the same Israeli team. The two ended up on different clubs and played against each other. Then, in 1983, both Sack and Blatt made the Israeli national team that competed in the World University Games in Edmonton, Canada. They practiced together and grew close. "David was a great point guard," Sack said. "The best basketball I every played in my career was when I played with David. He brings out the best in other players and in the players he coaches." Sack said Blatt excelled in assists but his best assist was off the court. Blatt pressured Sack to meet his girlfriend's best friend – Aviv Shilo. Sack and Aviv have been married 30 years. "Kidding around, I tell him that most of the time I like and thank him for that," Sack said. After the World University Games, Blatt continued to play basketball in Israel, then moved to Atlanta, where he worked a couple of years for Xerox. Sack brought his new wife to America to meet his parents, and the couple visited Blatt. "He shared how much he missed playing ball and living in Israel," Sack said. "We encouraged him to follow his heart, and he ended up back in Israel." In 1989, Sack moved home to the United States but stayed in touch with Blatt, visiting him in Israel once a year. An Achilles tendon injury ended Blatt's playing career, and he started coaching. Last year, his Maccabi Tel Aviv won the Euroleague and Israeli Premier League championships. Sack knew that NBA teams were contacting Blatt about possible coaching positions here. "I started whispering to my family and close friends that I had a feeling David was going to end up in Cleveland on the coaching staff," Sack said. "I had no inside information, just a feeling. Sure enough, the Cavs called Blatt for an interview. "I told him if he took a job in Cleveland, there would be a lot of love for him here," Sack said. "That was before the Cavs signed Kevin Love, so we joke about that today." Sack didn't anticipate the Cavs naming Blatt head coach but he knew his friend was capable. "Coaching Maccabi Tel Aviv in Israel is like coaching the New York Yankees or New England Patriots," Sack said. "It's Israel's pride and joy because it's so successful in Europe. There's a lot of pressure and scrutiny, so he's far from being inexperienced. He's a winner." At first, Sack and Blatt talked about the challenges of building a young Cavs team and possibly bringing in veterans to help. "Then boom, a week or so later, LeBron James came back, and David's world changed forever," Sack said. "The expectations went sky high. There wasn't necessarily time to build a team, but he was up for it." Sack said the Jewish community in Northeast Ohio wants to make Blatt feel welcome, but opportunities to meet people have been limited. Coaching the Cavs, and preparing for the season, have been all consuming. "As a general rule, there is a lot of respect and admiration for David's work ethic, and people love his press conferences," Sack said. "He gives straight answers and integrates humor into those forums." Even Sack has not been able to spend as much time with Blatt as he would like. "My wife and I have made it clear to him that we would send him invitations," Sack said. "If he can make it, fine, if not, we understand."